As a final summary of horse color genetics, let’s go over the loci, what they do, and the alleles at each locus. My primary reference is Sponenberg. The Agouti locus is widespread in mammals, and is involved with whether and where an animal produces eumelanin (black) or phaeomelanin (red) pigment. The alleles known in horses, listed with the most dominant first, are Wild Bay (Wild-type), Bay, Seal Brown and black. Agouti is hypostatic to Extension, meaning that the effects of the agouti alleles can be seen only if the extension gene allows the animal to produce both eumelanin and phaeomelanin. Note that at this locus, the redder the color, the more dominant. The Extension locus is the same as the melanocortin receptor one locus, or MC1R. Like agouti, it influences whether eumalin or phaeomelanin gets into the coat and occurs in most mammals. The alleles are dominant black (still not confirmed), wild-type, and chestnut. This locus may also have genetic control over the depth of black tipping. Only wild-type and tipping allow the agouti genes to show. In this series, more black is dominant over more red. Extension is epistatic to agouti. Agouti and extension determine the base color of the horse—bay, brown, black or chestnut. The various dilution genes generally affect phaeomelanin and eumelanin differently, mane and tail hair and body hair hair differently, and not uncommonly are associated with patterns of dilution. The Dun locus has two alleles. Wild-type is dun and is dominant over non-dun, but the wild type is rare in many breeds. When present, dun dilutes both black and red pigment on the body, but the degree of dilution varies a great deal. Head, legs, mane and tail are generally much less affected than is the central body, and dorsal stripes almost always occur. “Zebra stripe” markings often occur on legs and the shoulder region. The dorsal stripe may continue down the center of the mane and tail, with the edges diluted. The Cream locus is also known as the membrane-associated transporter protein (MATP) locus. It probably has three alleles: Wild-type, pearl, and cream. The dominance hierarchy here is complex. A horse with two wild-type alleles is normal color. 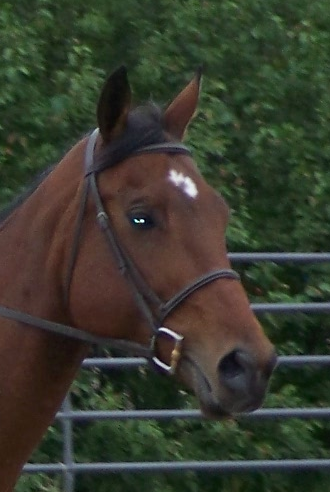 A horse with one wild-type and one pearl allele looks normal color except for slightly lighter skin. 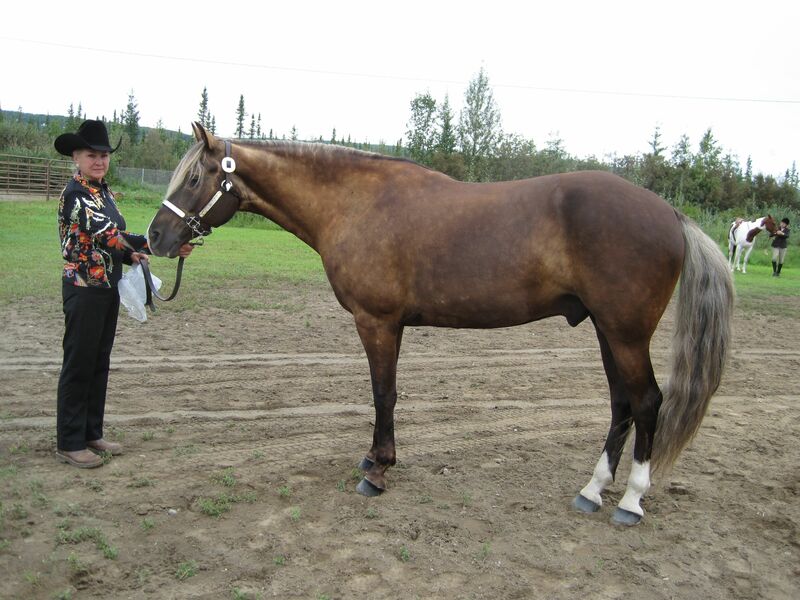 A horse with two pearl alleles will have red lightened to gold and black lightened to beige. A horse with one cream allele and one wild-type allele will have red lightened to gold and black lightened only very slightly. A horse with one cream and one pearl allele will have red lightened to pale cream or ivory and black lightened to beige. Finally, a horse with two cream alleles will be a very pale color, as red lightens to cream and black to a slightly dirty white. The Champagne locus is the SLC36A1 locus. It has two alleles: Champagne (dominant) and wild-type. Champagne dilutes red to gold and black to brown or tan. The mane and tail are generally diluted less than is the body. The Silver Dapple locus is the pre-melanosomal protein 17 (PMEL17) locus. It has two alleles, silver (dominant) and wild-type. The silver allele dilutes black strongly but has little or no effect on red. The allele also produces very strong dilution in mane, tail and lower legs, at times producing horses that appear black with white manes and tails. Far commoner are horses with a blue to chocolate body, often heavily dappled, with distinctly lighter manes and tails. At one time common primarily in ponies. The Mushroom locus has not yet been located. Two alleles are suspected, wild-type (dominant) and mushroom (recessive.) Mushroom horses resemble silver dapples, but lack dappling and have tested chestnut at the extension locus. Arab dilution is another possible locus. This is believed to be a recessive allele with a strong lightening effect on black but little or no effect on red. Both Mushroom and Arab dilution are very rare. I will summarize patterns of white, including grey and roan, next week. Look at the ear tips on this bay. This article was originally posted April 24, 2011. It is being repeated here with new photos and some revision. Horse colors are due to the interaction of a large number of genes, many of which we’ve discussed. These may be divided into base color genes, diluting genes, genes that cause interspersed white hairs and marking genes. One type we have not discussed, because the genetics are not really understood, is interspersed black hairs. For the rest of this discussion I will assume the horse is of one of the base colors, but sooty and shading can occur with any dilution or marking genes, or together with roaning or grey. You just have to remember what the other genes do to red and black pigment, or if they have different effects on coarse and fine hair. Chestnut with sooty gene. The dark mane and tail almost look bay, but the lower legs clearly identify this horse as a chestnut. Liver chestnuts are often sooty. It takes careful examination to tell if a chestnut has interspersed black hair, but when I was examining them with a magnifying glass, this was true of every liver chestnut I examined. Even red chestnuts often have a few black hairs mixed into the coat and the mane and tail. Bays can also be sooty, but this may be confused by the presence of shading. In order to understand black shading, it is necessary to go back and look at how the agouti locus affects mammals in general. The locus got its name from a middle and South American rodent, the agouti. This animal has fur in which the individual hairs are banded in black and yellow. As it happens this is very common in mammals, and a number have banded hair. Unless the hair is very coarse this is not obvious—wild gray mice and rabbits, for instance, really have hair banded in black and light yellow. The banding may vary from multiple bands on a hair to hair with red/yellow/cream bases and black tips. The banding may also vary with type of hair, with some hairs (often the coarsest) being solid black and others (often the finest) being predominantly yellow. This guy is a mule, but he shows an interesting combination of shading due to the depth of black tipping and the variation of red/yellow pigment. Remember bay and wild bay are due to genes at the agouti locus. Most bay horses have at least some banded hair on the body, usually with a red base and black tip. This is easiest to see around the edges of the ears, and the banded hairs tend to be most numerous along the spine and spreading down to cover the hips, shoulders and upper barrel. It’s been a long time since I actually looked at individual hairs with a magnifying glass or under a microscope—I was doing this in the late 60’s and early 70’s. 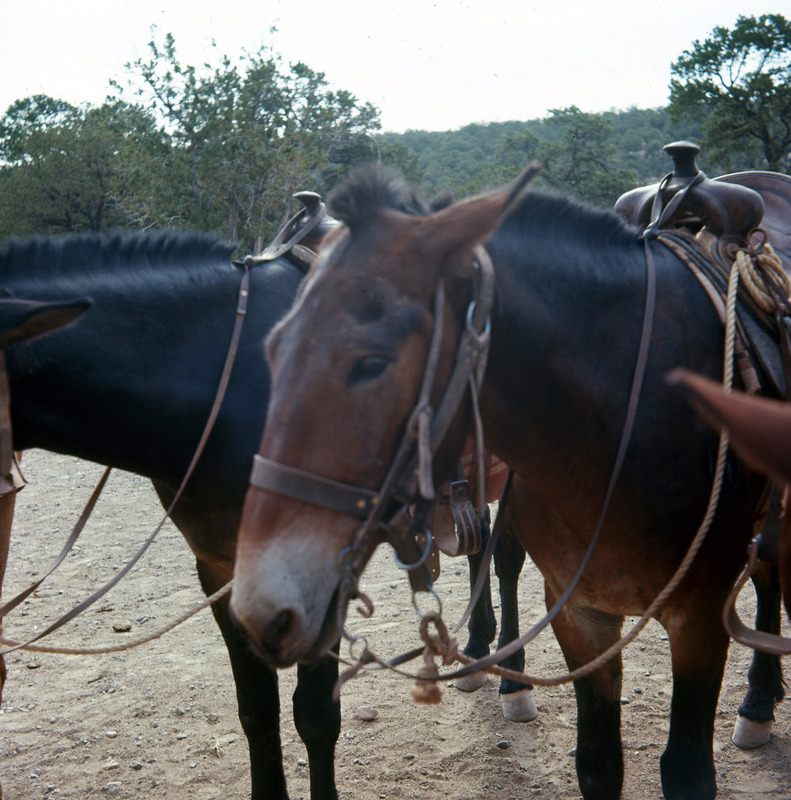 But as I recall, just about every bay or buckskin horse I looked at had at least a few black-tipped hairs. In some, the black tipping produced a shaded effect on the body of the horse. A few horses look black or seal brown in summer coat and quite different in winter. I recall two of these. Duchess was a typical seal brown in the summer—black with tan shading on her flanks, muzzle and under her tail. In winter she looked dark bay. Careful examination of her winter coat showed red near the skin with deep black tips. In her short summer coat, apparently only the tips showed. The other was even more striking. I first saw him in winter coat, and thought at first he was a blue roan. Careful examination of his coat showed yellow bases with black tips rather than interspersed white hair—a buckskin with deep black tipping. In summer, I knew he was the same horse only because the stable owner identified him—he was a typical seal brown. Note that this shaded effect due to black tipping is quite different from the counter-shading often seen in red/yellow pigment, which leads to the undersides being lighter than the back. This is very common in mammals, and tends to offset the fact that light comes from above, making the animal less visible to predators. The shading in a bay may be due to the same selection pressure, but the effect on the individual hairs is quite different. This is an area that needs much more research. Unfortunately with the prominence of DNA in genetic research, researchers seem not to be paying as much attention to the distribution of pigment in the hair. 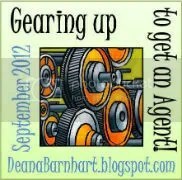 This is an update with photos of an article originally posted April 17, 2011. Not all horses with the leopard gene have blankets of any size, and not all have spots. The gene can also produce two specific types of roaning, called frost and snowflake. Chestnut varnish roan. 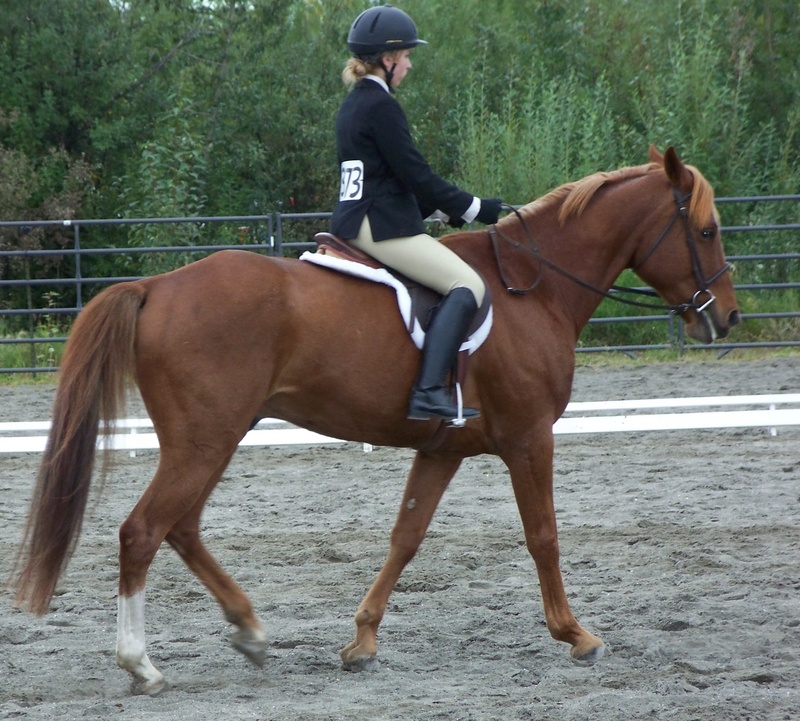 This horse has almost no white markings, and a full mane and tail. These roan patterns are quite separate from that produced by the roan gene, which becomes less prominent with age and leaves head, legs, mane and tail dark. The leopard gene produces horses which are normally colored or at most have a few white hairs over the rump at birth, but develop roaning (frost) or scattered white spots (snowflake) as they age. In contrast to grey, the pattern eventually stabilizes rather than producing a pure white horse. In frost, the roaning tends to be most prominent over the hips. So-called varnish marks are common — areas where the bones are close to the surface, such as the hipbones and nasal bones, retain pigment while the rest of the coat is roaned. An aged varnish roan may be almost white except for these varnish marks. Another chestnut varnish roan, this one with a blaze and three white stockings. This one has the white organized into a near blanket over the hips, with spots on the blanket. Snowflakes are small white spots scattered randomly over the body, but often most numerous and prominent on the front part of the horse. They tend to become larger and more numerous with age, until in extreme cases the horse appears white with colored specks. This gives what is often called a speckled pattern, not to be confused with flea-bitten grey. Note that not all of the photos shown at the link are true snowflakes — the term is used very loosely. Both types of roan may be combined with any of the blanket or spotting patterns, or may occur alone or together. Figure 8.140 in Sponenberg is a beautiful example of a combination of snowflake, varnish roan, blanket and leopard spotting all on the same horse. (Put Figure 8.140 on the search inside field.) Since the leopard gene can produce any of these effects, alone or in combination, breeding leopard-pattern horses can lead to some interesting results. I will summarize the equine color loci and alleles next week with links back to where they are mentioned, but I have covered most of the known color genes in horses. That doesn’t mean more won’t be found! 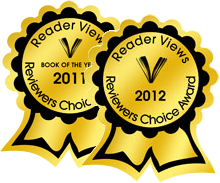 A last comment: Horse Power, with the Leopard horse on the cover, is FREE today on Amazon.com. The pattern most people first think of in Appaloosa horses is the one that gave the gene its name—leopard. This pattern gives a white horse with round or oval spots of base color. There may be shading of the genetic base color on the flanks, behind the elbows or on the head. Most people would call this horse a chestnut leopard. In fact he combines a white rump, extreme roaning or snowflake, and clearly defined spots. Note the haloes on several of the spots. Genetically, a leopard must have at least one Pattern-1 allele in order to have most or all of the body white. In addition, it must have one leopard allele and one wild-type allele at the TRPM1 locus. Two leopard alleles will lead to a few-spot leopard, with only a few colored spots. Other factors leading to the leopard pattern undoubtedly exist, but are still unknown. The mane and tail may be mixed in color if some of the mane and tail hair grow from colored spots. The spots may have roan edges, called haloes, which normally develop after birth. Blacks tend to have more and larger leopard spots than do chestnuts, with bay being intermediate. 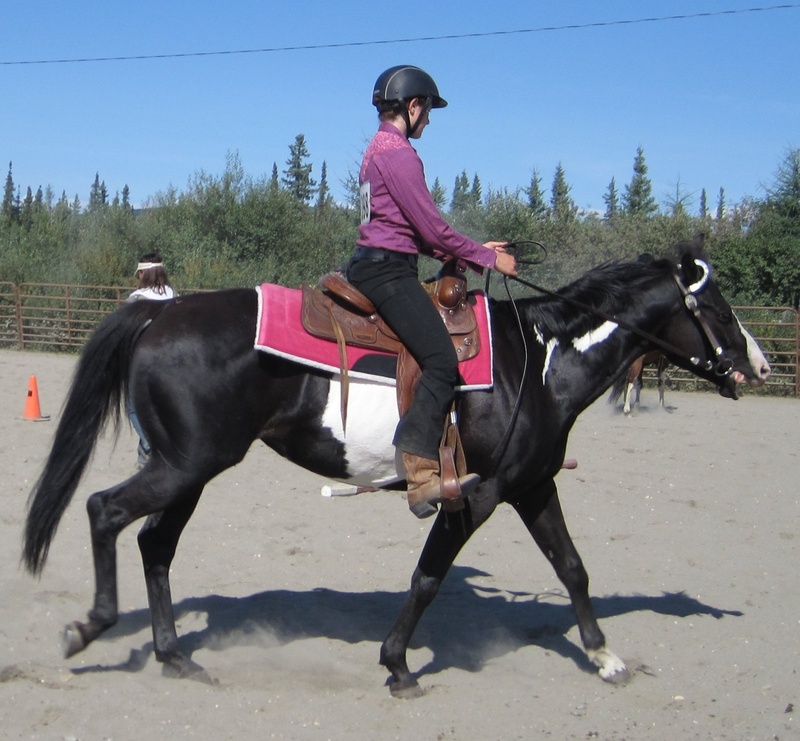 Also, horses with black mixed in the coat (sooty) will sometimes have the black and red colors form separate spots. Three of the horses in Tourist Trap have leopard markings. Another view of the same horse. Note the white “lightning strike” markings on the forelegs. Token is the mare ridden by Flame. She is fairly tall—around 16 hands. She is a chestnut leopard, white with copper spots. Genetically, she is homozygous for the most recessive of the extension alleles, has two copies of the Pattern-1 allele and one of the leopard allele. She is wild-type at all dilution, pinto spotting, grey and roan loci. She could have genes for minor white marking on face or feet, but they cannot be seen. Dusty is the gelding ridden by Timi, who would just as soon not be riding. 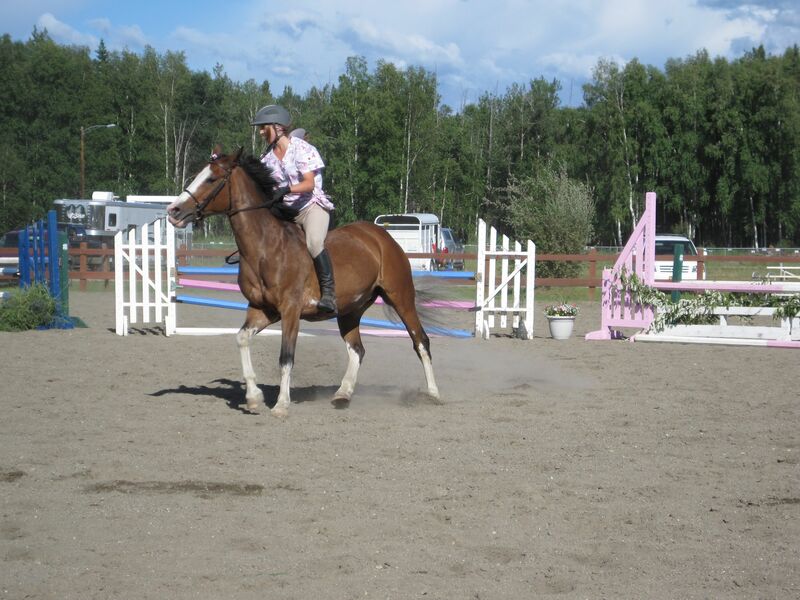 He is the calmest and laziest of the group, and the easiest for a novice rider to handle. He is also the least responsive to leg pressure. Dusty is a buckskin leopard, around 15 hands tall. He has wild-type extension genes, bay alleles at the agouti locus, and one cream and one wild-type gene at the cream locus. His pattern-1 and leopard alleles are the same as Token’s. He has quite a lot of white in his mane and tail, so they are not noticeably sparse. 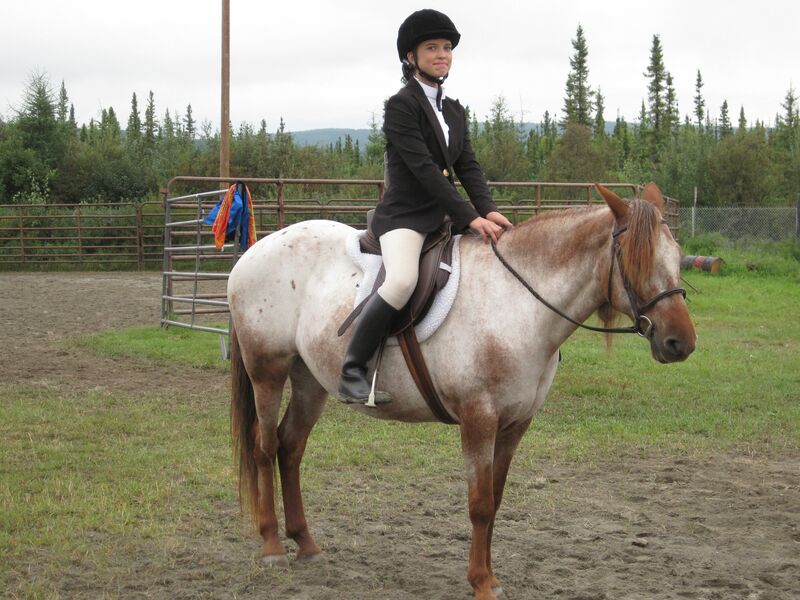 Penny is the guide and her horse, Freckles, is a bay leopard gelding. Freckles is a little keener than the horses assigned to Penny’s clients, but he’s a bit younger and the cross-country trip is part of his training. Freckles’s underlying bay color is a little sooty, so he has both red and black spots. Genetically he is the same as Dusty but with sooty and without the cream allele. The other two horses have the leopard allele but are not leopards, and I’ll talk about them next time. 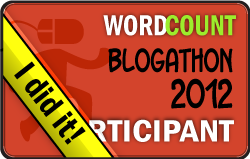 This was first posted, without photographs, April 2 2011. This information was initially blogged, without photographs, on March 29, 2011. All genes for white markings produce a wide range of amounts of white. The leopard (Appaloosa) gene produces not only a wide array of amounts of white, but also of patterns. Unlike other spotting patterns, it is often progressive with age. Because the patterns produced by the leopard gene vary so much, I will spend more than one week on them. 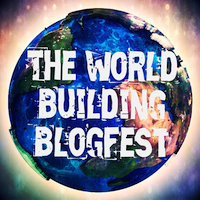 This week, I will focus on breaking the patterns down into components, following Sponenberg, and commenting on their distribution and genetics. In the United States, the leopard gene and the patterns it produces tend to be associated with specific breeds, notably the Appaloosa and Pony of the Americas breeds. The Colorado Ranger and the mustang often exhibit the leopard complex colors, as well. Worldwide, however, the leopard complex patterns are very widely distributed throughout Europe and Asia as well as the Americas. Further, most breeds which have any of these patterns have all of them—a further indication that a single gene is necessary. The only exception at the current time is that a second gene locus, Pattern-1, may be needed to produce the full leopard pattern. 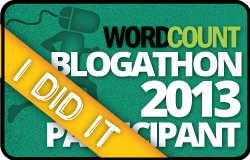 A number of other modifiers probably exist, but they are not known. None of these modifiers, however, seems able to do anything without the presence of at least one Leopard allele. Pattern-1 has not been located exactly, but it may be linked to the Extension locus (determines chestnut) on equine chromosome 3. Pattern-1 increases the amount of white in the coat and is necessary for full expression of the leopard pattern (not to be confused with the Leopard gene.) Yes, the terminology is confusing! The white sclera and mottled skin show clearly on this POA, which also displays varnish marks. The first set of characteristics produced by the Leopard allele includes mottled skin, striped hooves, and a white sclera in the eye. White ear tips can also occur. These characteristics are not definitive, as other color genes may cause them, but almost all horses with the Leopard gene show at least one of them. Horses with the Leopard gene may show other white markings, including the normal face and leg markings. If the leg markings are not present, white may still show on the cannon bones in what are generally called lightning marks or lightning stripes. Another thing the Leopard allele may do is to introduce interspersed white hairs in either of two patterns. Frost gives a fairly uniform distribution of white hairs over the body, most prominent over the hips and in minimal cases only over the hips. 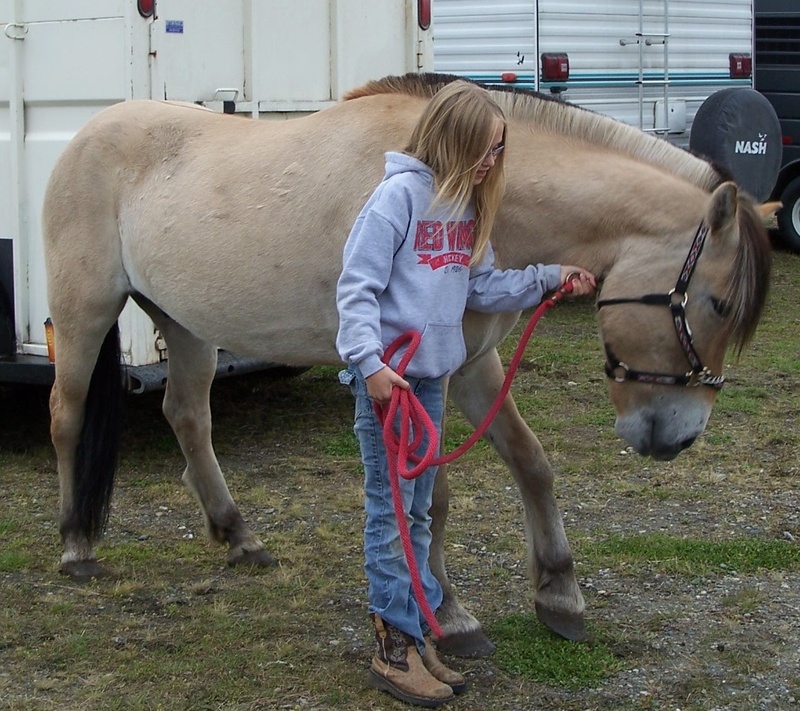 Unlike classic roan, the roaning develops after birth and increases with age up to a point. The dark head and legs of classic roan are generally not visible in this pattern. 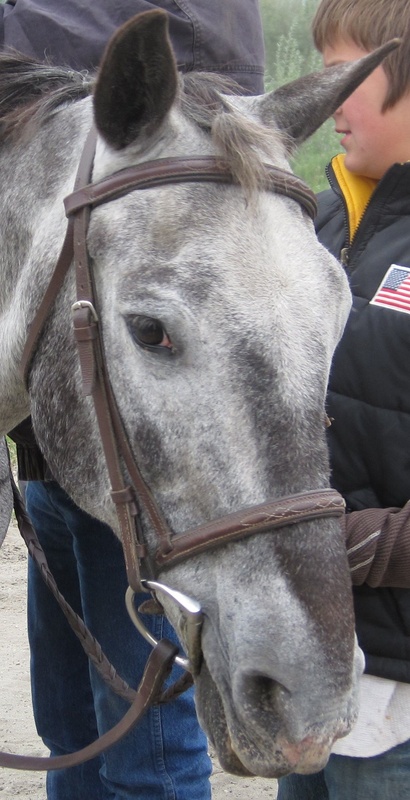 Unlike grey, the horse eventually reaches a relatively stable color. Snowflake has a similar developmental pattern, but is most prominent on the foreparts and the white hairs are concentrated into small white spots. Extreme frosty or snowflake patterns may develop into a speckled appearance, white with small colored areas. All leopard-complex roans may also have varnish marks, with areas over bony prominences (notably the nasal bones and hips) retaining dark pigment. The Leopard allele may also produce larger but symmetrical white markings, generally starting with a few small white areas over the hips and working forward and downward until the whole horse is white, with the flanks and throat being the last areas to lose color. This is the pattern most strongly influenced by the pattern-1 gene. If the pattern-1 allele is present, white is more extensive than if it is not present. Full white is only possible with the pattern-1 allele. These symmetrical white markings are usually present at birth, though they may increase with age. The Leopard allele can produce colored round or oval spots over the body. In most cases, these are visible only against a roan or white background, but occasionally they can be seen against pigmented areas of the coat. The spots may be darker or lighter than the base coat color. Surprisingly, these spots are more likely and more numerous if the horse has one Leopard allele and one wild-type allele. If the horse is homozygous for Leopard (has two Leopard alleles) the spots are more likely to be absent or sparse. Finally, two doubtful or deleterious aspects of the Leopard allele may be noted. First, leopard interacts with black-pigmented hair to make it brittle. The result is the sparse manes and rat tails often seen on leopard-complex horses whose base color is black or bay and who retain dark color in their manes and tails. Second, homozygotes for the Leopard allele are generally night blind. This is rarely a problem with modern usage of horses, but should be kept in mind if riding a homozygous Leopard over unfamiliar ground in darkness. The named horses in Tourist Trap all have the Leopard allele. I’ll describe Raindrop, Token, Splash, Freckles and Dusty as we get to the combinations of leopard markings that each represents. In fact, I’ll give the full color genotypes I’ve given each. The horse on the cover of Horse Power, near the top of the right sidebar, also has the leopard gene., as does Dottie in the story. In fact, Dottie is supposed to be a granddaughter of Raindrop, and inherited both the Leopard and Dun alleles from her. A few horses are all white, with dark eyes and pink skin. These are not to be confused with aged greys, which may have a pure white coat but retain dark or at least mottled skin, or few-spot leopards, which generally have mottled skin. This type of white can occur from the spotting genes we have discussed as producing pintos, especially if more than one type of spotting gene is present. There is also a type of dominant white which is lethal if two copies of the allele are present but which if one white and one wild-type allele are present produces a healthy white horse. Remember also that many of the dilution genes we have discussed can produce a very pale cream color often mistaken for white, though most of these horses have light eyes. All white marking genes on horses, from a conservative white star to a white horse with colored ears, seem to work by preventing the pigment-producing cells from getting to parts of the horse’s body. They do not affect or replace other genes for color. Thus no matter how extensive the white markings on a horse, it will still carry alleles at all of the color loci we have discussed. Further, it will pass those alleles on to its foals. 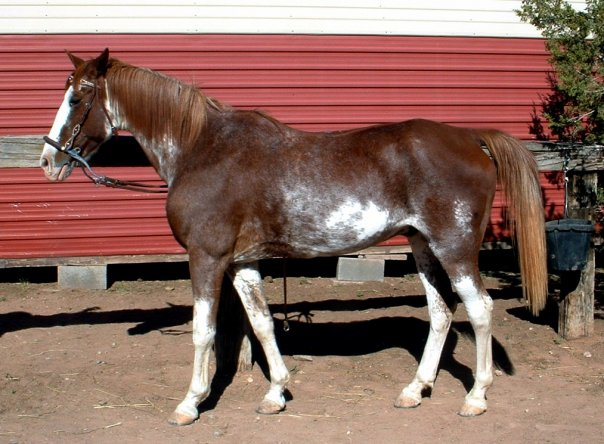 The white spotting genes grouped as “pinto,” “paint” or “parti-color” may occur in any combination consistent with the survival of the foal. (Two copies of the frame allele at the frame locus, for instance, results in white foal syndrome and early death regardless of what else is present.) A horse could easily have one frame allele, together with two each for sabino-1, tobiano and splash. Because the white areas from these alleles tend to affect different parts of the horse, the result could be a white horse. When bred to plain mates, the offspring would probably be spotted. Horses with spotting due to a single locus can also be white or nearly white if they are close to the extreme version of that pattern. Several of the spotting patterns converge to a “medicine hat” or “war bonnet” pattern with maximal white. This is probably most common in so-called tovero horses—those that combine tobiano spotting alleles with any of the non-tobiano alleles at other spotting loci. In general the ears are the last areas to lose pigment. There is one type of pink-skinned white with dark eyes that does not appear to produce spotting in the offspring. White to white breedings of this type, however, always produce some colored foals. Examination of the numbers of white and colored foals suggest that two white alleles at this locus are a prenatal lethal—the foal never develops or is aborted so early that the breeder assumes the mare has missed. This type of white is believed to be due to a dominant gene. 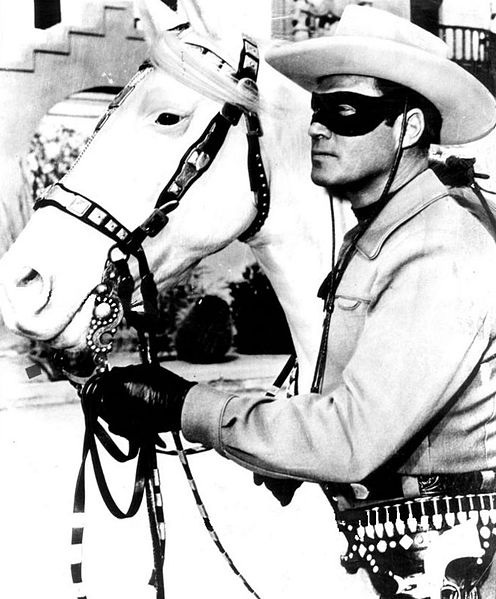 Publicity shot of the Lone Ranger with Silver. Note the dark eyes and pink skin. The white allele seems to have a surprisingly high mutation rate. Thus whites have been produced from colored parents in several breeds, and then reproduced as if they were dominant whites. I do not know whether DNA proof of parentage was available in these cases, however. I do not believe a gene test has been developed for this type of white. Gene tests at other loci could be very useful, however, in determining what other color alleles the horse carries and could pass on to its foals. White is a spectacular color and for that reason was popular in the age of horse power for flashy coach or cavalry horses. At least two western heroes — the Lone Ranger and Hopalong Cassidy — rode dominant whites, Silver and Topper. The downside? Keeping a white horse clean may be a problem, and the pink skin may be subject to sunburn. White hoses are not albinos, although the initial name of the “breed” registry was the American Albino Horse registry. More online information can be found at The American White and Cream Horse and the Camarillo White Horse Association, though there is some question as to whether the two are genetically the same. This time I’m discussing a pair of markings that may or may not be genetic: manchado and brindle. Sorry, I don’t have any photos, but scroll down the White Horse page and look at Figure 8.120 in Sponenberg. Manchado is in the pinto group if it is genetic, but it has hardly been investigated at all. Sponenberg says it is primarily found in Argentina, but it is found there in several breeds. This is taken by some as indicating an environmental cause, and by others as indicating that Argentineans pay more attention to horse color than do people in other parts of the world. There is no question that manchado is different from other spotting genes. At first glance, it is a combination of pinto and leopard (Appaloosa) traits, but manchado horses do not have known leopard or pinto genes. The minimal expression is white on the top of the neck, giving a partially white mane, like tobiano. The head and legs normally remain dark. The white areas are crisp-edged, but these white areas normally have round or oval colored spots within them. There are a few photos on the web, most notably one showing a Throughbred stallion and an Arabian mare, both breeds which are rarely spotted. Sponenberg shows a photo of a Welsh Pony with the Manchado pattern, but does not state whether is particular individual was from Argentina. Brindle is a little better understood, but not by much. There are three types of bindles, one involving black stripes, one involving white stripes, and one in which the horse is actually a chimera. In the first two cases, much more common genetic mechanisms appear to be necessary. For black stripes, the horse must have black interspersed hairs, a condition called sooty by geneticists. In most horses, the interspersed hairs are uniformly mixed into the coat or more numerous toward the back of the horse. In a few horses, the black hairs are organized into vertical stripes. If white hairs are present, as in roans, they may also occasionally be organized into vertical stripes. This is also referred to as brindle, though it is not known whether this type of brindle has any relationship to the type with black stripes. The rabicano pattern is an example of this type of brindling. Finally, it is possible that two fertilized eggs are merged in early gestation. The chimera that results actually has tissues with two different DNA sets, and these tend to be arranged in vertical stripes. A brindle of this type could actually combine any two colors found in horses. 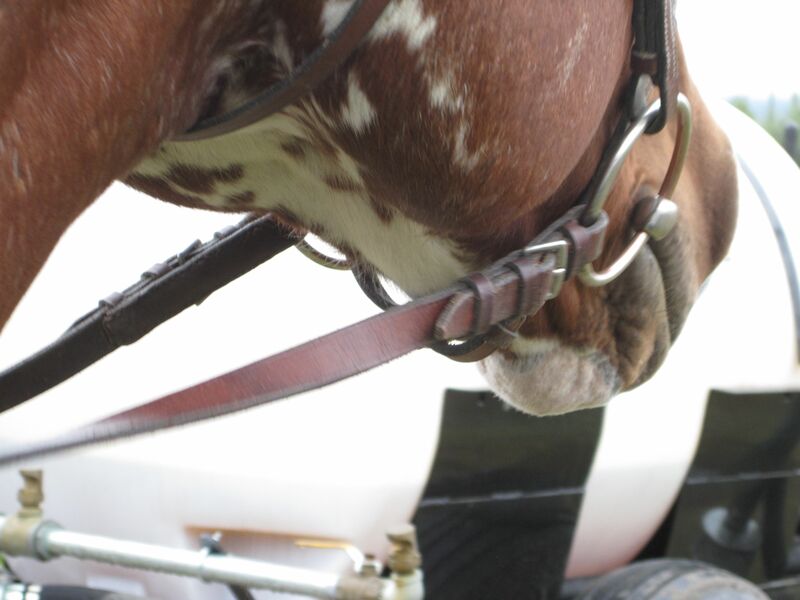 A website from White Horse Productions has excellent photos of these and other rare modifiers in horses. Scroll through the entire page. Splashed white is another spotting gene in horses. It resembles tobiano in that the pattern is usually crisp-edged, and there is no tendency for the kind of uneven roaning often seen in sabino. Splashed white is more common in Europe than in North America, but is becoming common in Paints. The best description of splashed white is that the horse looks as if it had been dipped feet-first in white paint with its head lowered. Minimal white markings may not be recognized as due to a spotting gene. The next stage includes a blaze that widens toward the muzzle and may extend up the sides of the head, white extending above the knees and hocks, and possibly a belly spot. With stronger grades of spotting the entire head is often white, as well as the entire underbody, and eventually only the ears may retain pigment. Eyes are usually blue or have blue chips. Splashed white can be confused with very crisp sabino markings without roaning, but sabino-1, at least, can be identified through genetic testing. I am sorry I have no photographs of this pattern, but it is rare in North America. Even Sponenberg’s photos are of Icelandic horses. Splashed white can be very difficult to tell from a crisply marked sabino without roaning. The amount of head white would be unusual for a tobiano. 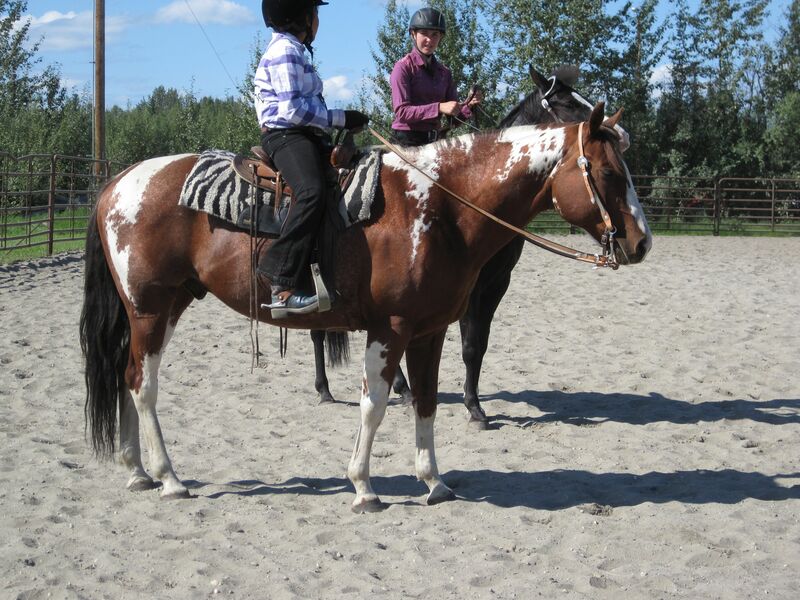 In general tobiano markings look as if white paint was dripped over the horse from the top, while the white in splashed white gives more the appearance of coming up from the bottom. The pattern occurs and is being selected for in Paints, and is known in Icelandic horses, Welsh Ponies, and Finnish Draft Horses. It also is known in the Appaloosa. Splashed white appears to be associated with deafness in horses, though many splashed whites have normal hearing. Splashed white is believed to be due to a dominant or incompletely dominant gene, though the wide range of patterns produced by this gene makes genetic studies difficult. There is evidence of at least one white horse being homozygous for splashed white. At the present time, a DNA test for this gene is not available. There is conflicting evidence as to whether this pattern is associated in any way with the KIT locus. Chestnut paint. This particular horse appears to have the frame allele rather than sabino, judging from the face and lower legs, in spite of the ragged appearance of the spots. 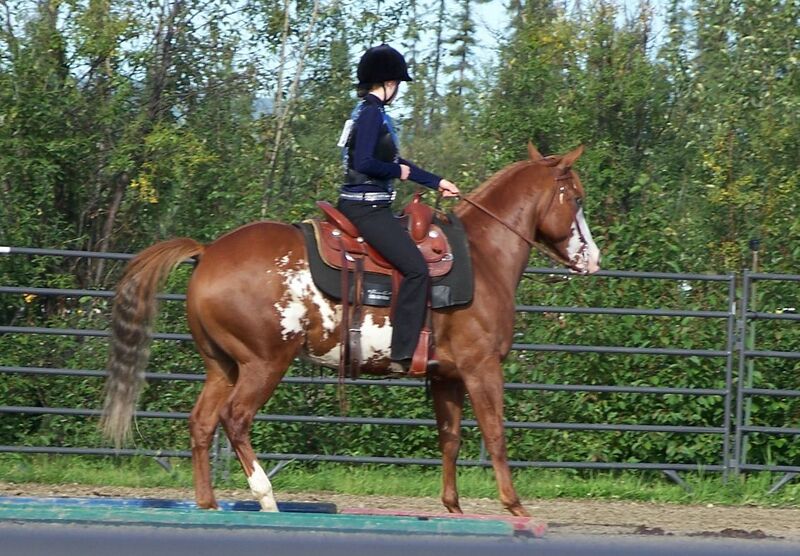 Frame is another type of spotting gene in horses, formerly lumped into overo and sometimes called frame overo. It has nothing to do with the KIT locus, unlike tobiano and sabino-1. Frame involves patterns of white which do not usually include roaning, though frame may occur in conjunction with other genes that cause roaning. In frame, the white areas tend to be arranged horizontally on the sides of the horse, and almost never cross the back. Frame is also almost the only pinto pattern in which the legs remain pigmented, though normal leg markings may occur. 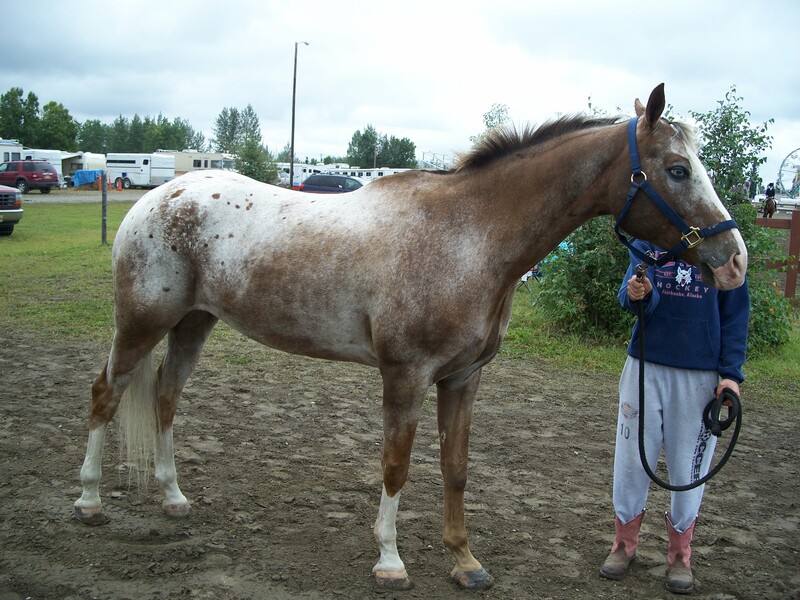 Like all spotted horses, frame horses may vary from mostly colored to predominantly white. 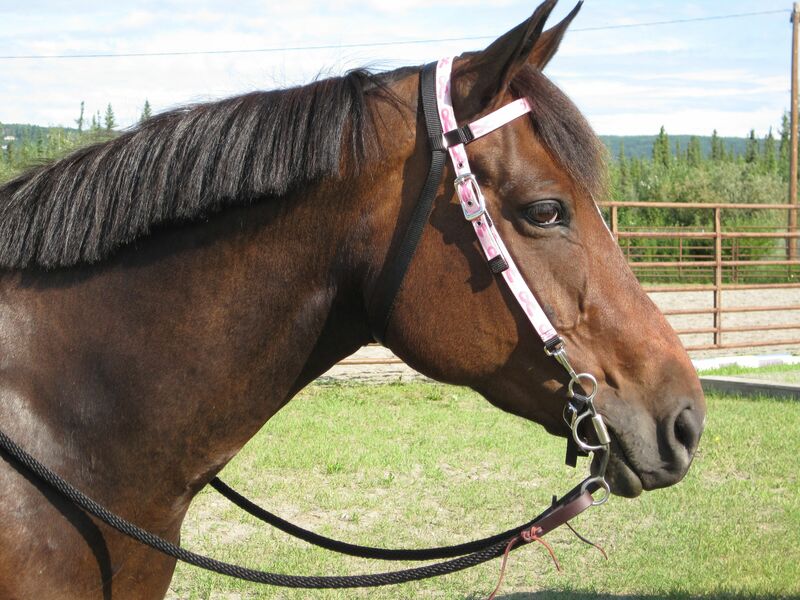 A frame horse will almost always have a wide blaze or bald face, and an apparently unspotted horse with a bald face but no white leg markings is likely to be a minimally marked frame. As the white expands the head may become mostly white and the white areas on the sides may expand to cover most of the horse, with the spine and legs being the last areas to lose color. Another Frame. Note minimal leg markings with wide blaze and white spots on sides. Frame is due to a single allele, frame (Fr), at a locus called endothelin receptor b (EDNRB) on equine chromosome 17. The locus has two known alleles, frame (FrFr) and wild-type (Fr+). Frame horses, some of which are so minimally marked as to look solid, have one frame and one wild-type allele. Breeding two frame horses together may produce lethal white foals, with two frame alleles. Such foals are born white, and the part of their nervous systems that controls the lower intestinal tract does not develop properly. They normally die within 72 hours of birth, though most are euthanized as soon as they are recognized. Most breeders avoid mating two frame horses together in order to avoid the production of such foals. The frame allele can be tested for. Such testing has demonstrated that some genetically frame horses appear to be solid colored. Whether this is due to a suppressor gene or genes or is simply the extreme end of random variation of amount of white is unknown. 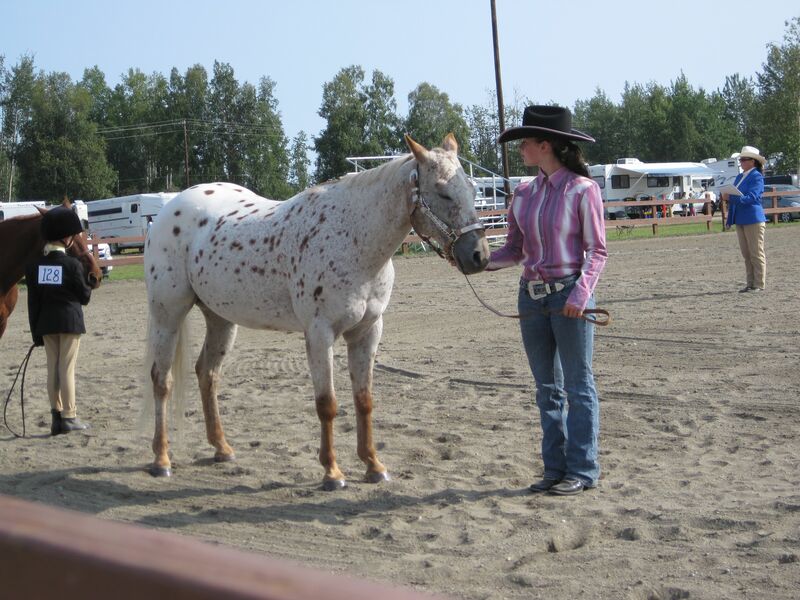 For many years two types of “pinto” spotting were recognized—tobiano and overo. Overo has now been broken into a number of distinct spotting genes—frame, splash, sabino-1, other sabinos, polygenic sabino, some types of dominant white, and manchado. Sabino now seems to be as much a grab-bag of genetically different types of white markings as overo once was. Here I will concentrate on Sabino-1, while noting that several other genetic types of sabinos and dominant whites seem to be associated with mutations at nearly the same locus. Sabino with near minimum markings. The sabino pattern has a wide variety of expressions, and some can be easily confused with other types of spotting, or even with roan. Sabinos not infrequently have areas of roaning as well as white spots, or flecks of color within the white areas. Almost all have white feet and facial markings, and the minimally marked ones can sometimes be detected by narrow extensions of the white up a leg or down the throat. The horse in the photograph to the right, for instance, has extensions of the high stockings in points up the legs as well as small white belly spots. Sabino head, showing white underside. In contrast, tobianos tend to have white legs but relatively plain faces, while frame horses have heavily marked faces with generally dark legs. It is unlikely that a sabino would have a completely plain head or completely dark legs, but sabino can certainly mimic any of the other pinto patterns combined with normal face and leg markings. The sabino-1 allele is due to a single base-pair change in intron 6 of the KIT locus on equine chromosome 3. 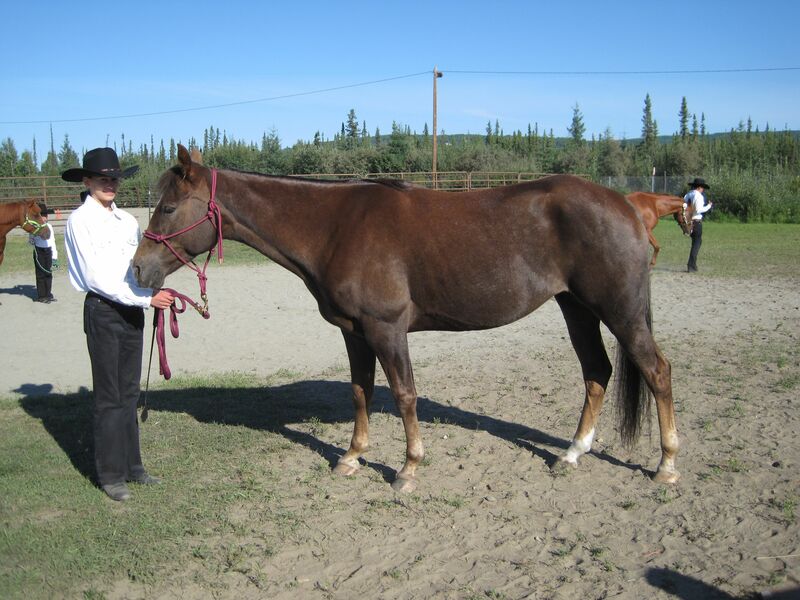 This means it is very tightly linked with tobiano and roan, both of which are also associated with the KIT locus. There are actually a number of mutations at the KIT locus that can produce sabino-like patterns. Note the ragged, flecked appearance of the white. Sabino-1 is incompletely dominant to the wild-type allele. This means that a horse with one sabino-1 allele and one wild-type allele will be a typical sabino. 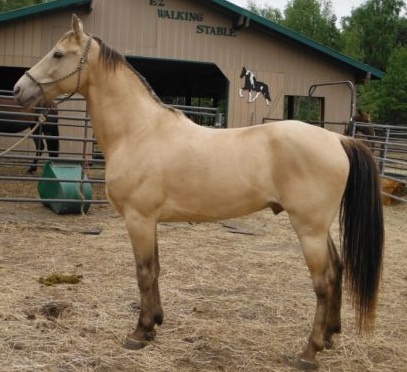 A horse with two sabino-1 alleles may be mostly white, often with a pattern approximating the “War bonnet” pattern—color in a head bonnet, chest patch, flanks and tail base. 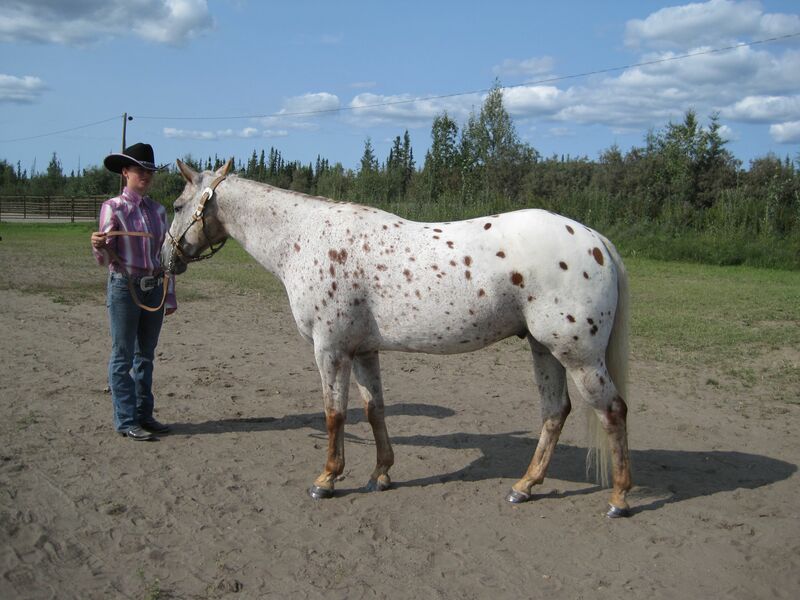 This pattern, however, can also be produced by combining the tobiano and frame genes. Sabinos sometimes come from two parents that appear to be non-spotted, but as with tobianos, one parent is generally a minimally marked sabino. Some of the other KIT-related sabino alleles may be lethal when the foal inherits them from both parents, but this is still being investigated. There is also the problem that it may not be possible to determine visually whether a sabino may have more than one spotting gene. The sabino-1 allele is well known and a genetic test is available.